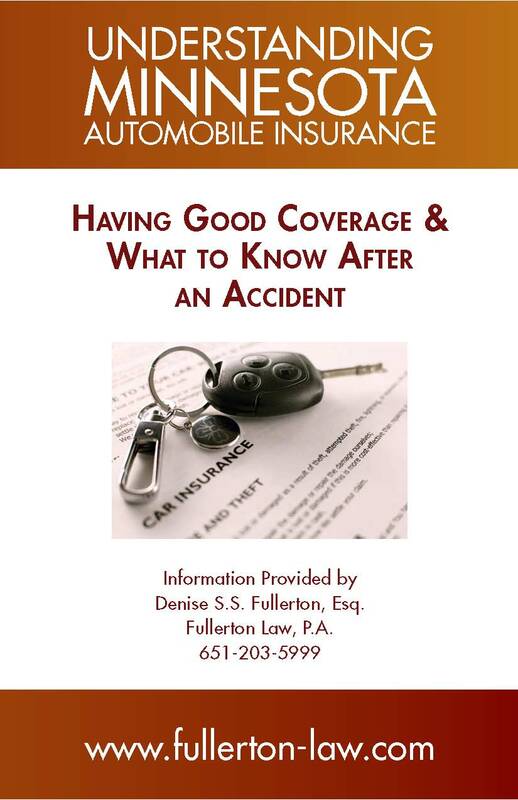 After years of seeing car accident victims realize after the fact that they did not have adequate insurance, or make errors after an accident that compromised their legal rights, Denise Fullerton prepared this booklet to educate the public about how Minnesota Automobile Insurance works and what to do after an accident happens. Click below for the full booklet in a digital PDF format, or contact Fullerton Law, P.A. to request paper copies by mail. Click above for a digital PDF of this booklet. To request physical copies, please send a request via email, telephone, or the contact form. Please include your mailing address and the number of booklets requested.